The same problem plagues the battle of Dol Guldur. In The Desolation of Smaug, Gandalf is hopelessly outmatched by Sauron. In Bot5A, Galadriel, Elrond, Saruman, and Radagast come in, beat up the Ringwraiths, and force Sauron to flee. What has changed in between the movies to make Sauron so weak? Are the other members of the White Council really that much more powerful than Gandalf? Then, right after the battle, Saruman announces that he will chase Sauron, but we never learn what happens to him. Does he confront Sauron? Is he corrupted by Sauron? Given how important the Dol Guldur plot was to the previous movie, Bot5A would have benefitted from providing a bit more resolution to this story thread before moving on to the battle. By contrast, Thorin’s descent into “dragon sickness” works well because it is given time to develop on-screen. The film takes its time, as Thorin gradually loses faith in his compatriots. The confrontation between Dwalin and Thorin is very effective. Dwalin, the stereotypical “warrior dwarf,” is frustrated that Thorin will not allow the dwarfs fight in the battle against the Orc army. At some points, Thorin’s voice is blended with Smaug’s voice, which subtly emphasizes the parallels between the two. The final bit of Thorin’s madness, in which he sinks into a puddle of gold, was probably a bit too on the nose, but symbolically it demonstrates how Thorin is figuratively drowning in his own greed. The titular Battle of the Five Armies is actually done well, for the most part. The choreography of setting up the Laketown, Elven, Dwarf, and Orc armies actually gives the battle an epic feel (perhaps more so than justified by a strict reading of the book, in which the battle is more of a haphazard affair). Dain Ironfoot is a fresh take on Dwarves. In his five minutes of screen time, he exhibits more personality and humor than the other 13 dwarves in Thorin’s company. Despite the excessive reliance on CGI Orcs and Trolls, the battle provides some interesting visual imagery. The snowy landscape provides a new setting for Middle-earth. 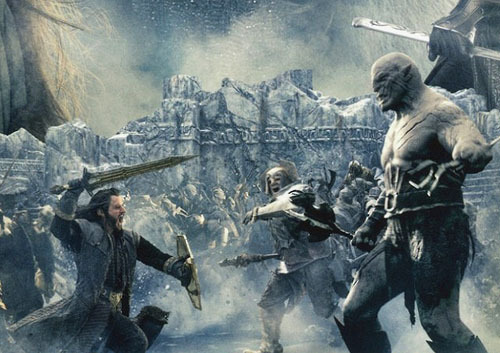 Even the final confrontation between Azog and Thorin on a frozen lake looked beautiful. I’m not sure why there was a frozen lake on a high mountain, but it certainly makes the scene more memorable than most of the battles in the Hobbit trilogy. I also admit I enjoyed the battle rams and pigs. Using different animals as steads was a neat way to give the battle a visually distinct look, one that took advantage of the story’s fantasy setting. After all, why does everybody have to ride horses or wolves into battle? The battle falls apart when the film focuses more on individual heroes, particularly Legolas and Thorin. Their fights against Bolg and Azog, respectively, seem to go on forever. There were several points at which I thought either Bolg or Azog had died, yet they kept coming back. And back. And back It actually drew attention from the broader battle, making it feel less like the Battle of the Five Armies and more like the Battle of the Five Main Characters. After all, Thorin’s charge was supposed to turn the tide of the battle, yet he barely participates in the main part of the battle. The film also has a number of continuity errors. For example, after the Battle of Dol Guldur, Saruman just runs off to chase Sauron and is never heard of again. Isn’t that the least bit suspicious? Radagast appears briefly during the battle and surprisingly lives. This begs the question of why he did not help Gandalf in The Lord of the Rings given that he played such an active role in these movies (of course, in the real world, we know that Peter Jackson simply chose to pursue a more faithful adaptation of the LOTR novels, which did not include Radagast). Perhaps there will be scenes in the extended edition that answer these questions. There are also just needless developments that contradict the LOTR films. Legolas goes into exile and plans to meet Aragorn, but in LOTR, it’s not clear that Legolas and Aragorn had ever met, much less had a special relationship. At the end of the film, a hobbit auctioneer states that Biblo had been away for 13 months, but there’s no way that the events in the Hobbit trilogy took 13 months as there was never any point at which a significant amount of time could have passed. Finally, Bilbo lies to Gandalf about the Ring, saying he’d lost it, yet in Fellowship of the Ring he and Gandalf talk about the Ring quite casually, with no hint that Gandalf was surprised to find it. I’m quite forgiving if Jackson decides to stray from the story told in the book, but he’s not even consistent with his own story. After having seen the final film, I’m more convinced than ever that the Hobbit movies would have been better as a duology rather than as a trilogy. This last movie seems more like a capstone for the previous two movies than a complete movie in its own right. It lacks a clear beginning, middle, and end. Make no mistake: there’s a lot of good material in the film. Casting, set designs, etc. are excellent. But they’re not great movies. I’d love to one day see a fan edit using the material to tell a story more faithful to the book. We might have to wait for the extended special edition DVD’s to see any sort of information about Saruman’s journey/encounter with Sauron, which is something the movie definitely lacked. Tauriel also adds in another continuity issue similar to Radagast’s. I went into the movie thinking she would die at some point (and there were scenes where she looked finished), but she is simply banned from Mirkwood by Thranduil. We really don’t know what happens to her after The Battle of the 5 Armies seeing as there is no mention of her (or Radagast for that matter) in LoTR. I understand the need for a strong female role in The Hobbit, but maybe it could have been done with Galadriel (in an Arwen-like way) instead of introducing a new character entirely. Oh I’d be shocked if we didn’t get a Saruman-Sauron scene in the extended version. I’m looking forward to it. Still, the theatrical release should tell a complete story. The Dol Guldur scene didn’t actually need to show Saruman chasing after Sauron – it could have cut out before that point. I could imagine Tauriel just becoming a lone warrior Elf in Mirkwood or somewhere else by the time of LOTR. Who knows, maybe she’s fighting against Sauron’s forces in the North. It probably would have fit the LOTR films better if she’d died, but I didn’t think it was necessary. However, I’d have thought that if Radagast survived into the LOTR era he would be in the thick of the action with Gandalf. I have a sneaking suspicion that he’s going to end up dying in the extended edition. You know, I think I need to rewatch Fellowship again. I didn’t remember anything indicating a preexisting bromance between Legolas and Aragorn, but I could be wrong.